Heading out to pick up some dental care items for yourself (and possibly for a significant other or your whole family) can seem like a trip that will take just a few minutes. However, when you come to the realization that you’re looking and shelves and shelves full of different (yet strangely similar) options, it can be very confusing. So, how to make shopping easier, to pick up everything you need, to address the preferences of your kids, to know if you’re making a good choice or a bad choice, and more, you think to yourself? Our Pella, IA team can offer pre-shopping help! If you don’t have a dedicated list that you use that includes the items you need for your dental care at home, then you should most certainly begin one. 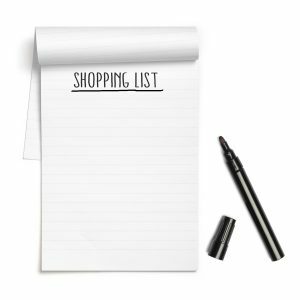 It might be one large list that also includes groceries and other essentials. Or, it may be a list specifically for dental hygiene items. Whatever the case, when you have a list that you can access on a daily basis, you can remember to glance at it when the day begins, when you’re considering heading to the store, and even when you’re at the store! The result? You always have what you need for your oral health. We know that you may not have thought about this in great detail but we love encouraging parents to bring their kids and teens shopping, too, particularly when dental care items are on the list. As kids get older, they will know how to shop for themselves in the future. For younger kids, they will light up with excitement as they get to choose their very own brush, toothpaste, etc. For everyone, when kids make their own choices regarding flavor and more, brushing and flossing at home often becomes much more enjoyable! Ask us during a dental checkup and cleaning about what you should be buying for yourself when it comes to best practices for your oral health. While sifting through details online in regard to important factors to consider in regard to dental hygiene products can become confusing, it’s easy when you talk with our team. We can quickly and briefly outline just what you should look for in terms of optimal products. For instance, we will suggest a brush with soft bristles, products approved by the American Dental Association (ADA), and more. Get this sorted out before shopping trips, so making choices is easy and fun! By speaking with us during your checkups and cleanings in regard to your dental hygiene products, you can quickly learn all about the details you should be looking for to keep your smile in wonderful shape! To learn more, schedule an appointment with your dentist by calling Allen & Neumann Family Dentistry in Pella, IA, today at (641) 628-1121.